The new John Deere 5R agricultural tractors have been specially developed for mixed farming and specialized agriculture applications. The three new models (John Deere 5080R, 5090R and 5100R) of 80, 90 and 100 hp respectively benefit from increased engine power, improved comfort with the new TechCenter cab and improved ergonomics. 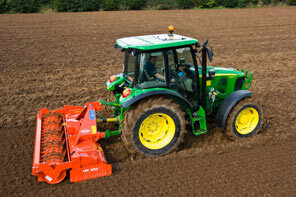 The John Deere 5080R, 5090R and 5100R farm tractors have an integral chassis for more robustness. The load capacity has been increased by 500 kg to suit all applications. These new farm tractors can be equipped with front and rear PTO and PTO while being compatible with John Deere front loaders. The new John Deere 5080R, 5090R and 5100R farm tractors feature a 4.5-liter Tier 3 PowerTech E engine. With its Common Rail technology, the engine delivers 7% additional horsepower and provides high torque at start-up . Two types of transmission are available on these John Deere 5R farm tractors: the PowrQuad Plus and the AutoQuad Plus, which automatically switch gears under load without disengaging. Electric clutch release provides comfort and versatility. The John Deere 5R Series boasts a new TechCenter cab with 310 ° panoramic visibility, air conditioning, high comfort pneumatic seat, tilt and telescopic steering column, new ergonomic shift lever, fold-down passenger seat and new storage compartments. This cab can be optionally equipped with a sunroof for added visibility. For passages less than 2.50 m high, it is possible to choose a low cabin. The John Deere 5080R, 5090R and 5100R John Deere agricultural tractor hydraulics would provide a high level of responsiveness while achieving a maximum lift capacity of 4.3 tonnes. The load capacity of the front linkage is close to 3 tons.